The pointer literal is the keyword nullptr. It is a prvalue of type std::nullptr_t. So nullptr is of type nullptr_t, and nullptr_t is defined to be the type of nullptr. Updated Release of "Effective C++ in an Embedded Environment"
You can log into Artima with the account you used to purchase the book, click on "Your Settings", and redownload anytime. If you've forgotten your password, you can get a reminder here. It would be a mistake to interpret the greater frequency of updates for the C++11 materials as meaning that I pay less attention to the materials on using C++ in embedded systems. I don't. The simple fact is that C++11 was in a state of flux up until final standardization, and since then compilers have been adding increasing feature support, plus I've been learning more about the features in C++11 and how to use them. There's been a lot happening in the C++11 world, and I've been working hard to keep my training materials current (while at the same time not bombarding you with updates). The world of C++ in embedded systems has been stabler, and so have my materials devoted to that topic. Even so, the changelog for the materials (available with your update) lists some five dozen changes affecting around 80 pages—about 25% of the total slides. None of the revisions are earth-shattering, but a lot of little things have been fixed or clarified or otherwise improved. I have a strong incentive to keep these materials in as good a shape as I can: they're the ones I use myself. I hope you enjoy the latest versions of my training materials on the use of C++ in embedded systems. As always, you can download a free sample of the materials (the first 30 pages) from the materials' sales page. Today I read Martinho Fernandes' post, "Some pitfalls with forwarding constructors." What caught my attention was his claim that a forwarding constructor (i.e., a templatized constructor taking a universal reference) is a copy constructor. "Can't be true," was my initial thought, because in the past it was true that it couldn't be true. But then I kicked myself. "Crawl out of the 1990s," I told myself (meaning 1998, the year of the first C++ standard). C++11 has new rules, and with new rules comes a new game. Setting aside edge cases we need not fritter away time on, the copy constructor for a class C takes a parameter of type const C&. If there is no such function declared in a class and such a function is needed (because it is used somewhere), it is automatically generated. This is absolutely true in C++98 and is typically true in C++11, and the difference between absolutely and typically is not of interest here. Where I'm going with this does not require acknowledging the nooks and crannies along the way. The key thing to recognize was that this template, though it could be instantiated to yield the signature of a copy constructor, is itself not a copy constructor, and that means that the class does not declare one. That being the case, if the copy constructor is needed, the compiler generates one as usual, because that's the rule: if there is no user-declared copy constructor (i.e., constructor taking a const Widget& parameter) and one is needed, the compiler generates one. The fact that such a function could be generated from a user-declared template is irrelevant. When the compiler sees a request to copy an object, it still has to consider the possibility of calling a template instantiation, but the template instantiation has the same signature as the implicitly-generated copy constructor, and (1) the copy constructor is a function (not a template function) and (2) when a function and template function are equally good matches for a function call, overloading resolution chooses the function. The end result is that copy constructors can never be generated from templates. To the best of my knowledge, all this remains true in C++11. The parameter to these functions would be the object being copied. That's w. w is not const. A call to the compiler-generated copy constructor would require the addition of const to get an exact match, but the call to the instantiated template requires no such addition. As a result, it's a better match. The copy constructor will not be called to copy w. Instead, the instantiated template will. 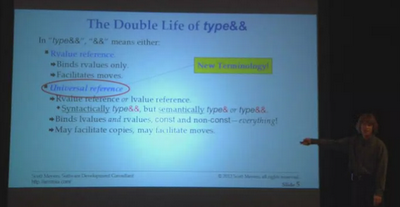 Now we're back in C++98-land. The compiler-generated copy constructor and the template instantiation have the same signature (both take const Widget& parameters), so the function wins. then reran the test (using auto-declared variables). The revised results? No extra constructor calls. Funky, no? Some of the following analysis is incorrect, but rather than simply edit the post to remove the wrong information and replace it with correct information, I'll add comments like this. gcc is making an extra call to the universal copy constructor only when I use brace initialization. My theory is based on the observation that when brace initialization is used to initialize a std::initializer_list object, the values in the braced list are copied into a temporary rvalue array. There are no std::initializer_list objects in my code, but let's suppose, for reasons I cannot fathom, that the use of auto in the above code somehow prompts gcc to treat a braced initializer as if it were being used with a std::initializer_list. creates an object of type std::initializer_list<Widget>, not, as I had thought when I wrote the original post, an object of type Widget. w would be copied into an array, and a request would then be made to move this array element into wcopy. But in the code where I declare no move constructor, no move constructor can be generated, because I've declared a copy constructor, and if you declare a copy operation, no move operators are generated. So in the code that requests a move of the rvalue in the array, the move is accomplished by calling a copy operation. though cw is const, the copy of cw in the array is not. That means that when the compiler has to choose between the copy constructor (which takes a const Widget& parameter) and the instantiated universal copy constructor (which, in this case, takes a Widget& parameter), the universal copy constructor is the better match. Why there is an extra call to a copying operation: because the first copy operation copies the initializing object into the array, and the second one copies it from the array to the target of the initialization. Why the extra call is to the universal copy constructor: because any cv qualifiers present on the initializing object are absent from the copy in the array, and the universal copy constructor is a better match than the conventional copy constructor for non-const objects. Why the extra call goes away when I declare a move constructor: because then the move constructor can be called on the rvalue in the array, but calls to copy constructors and move constructors can be optimized away under certain conditions (which are fulfilled here). Such call elision is generally not permitted for other functions, including the universal copy constructor. Which means that when the move constructor is missing and cannot be generated, the universal constructor must be called, but when the move constructor is present, it need not be called. I no longer believe that this is a bug in gcc, because gcc is doing exactly what I'd guessed: initializing a std::initializer_list<Widget> object. I just didn't think it was supposed to. Now I do. Anyway, bottom line: in C++98, copy constructors could not be generated from templates, but in C++11, they can be, practically speaking. At least that's my current understanding. Thanks to Martinho Fernandes for his post that sent me down this particular rabbit hole. Thanks also to Xeo for pointing out the error in my original post. I decided that if I'm going to be posting code, I might as well figure out how to make it look like code. In a comment on my last post, Nuno Barreiro's suggested I use SyntaxHighlighter, so I decided to give it a try. Never in the history of software development has there been a tool with more explicit no-brains-are-required installation and usage tutorials. My favorite is this one, because, really, how much more can you ask than for screen shots with arrows pointing where to click and "Click this" directives? I threw caution to the wind and did exactly as I was told. Security be damned, I wanted my code to be syntax-highlighted, and I was in a hurry! To get code to display properly, you have to enter it in HTML mode (at least in Blogger, which is the platform I'm using), and you have to remember to transform all opening angle brackets ("<") into their fetching HTML equivalents ("&lt;"). I use Centricle.com's Encode/Decode HTML Entities page for that. Write the code elsewhere, presumably where you can easily edit and test it. I use Emacs, but I've heard tell that there are other code and text editors. Transform the code into HTML-friendly form via something like the Encode/Decode HTML Entities page. In the words of technical support professionals everywhere, it works for me. As a demonstration, here's some code I've been playing around with this evening. The goal is to see which of several potential constructors is called when an object (an lvalue, if you insist on knowing) is copied. Try to predict what it will do before you feed it to your compiler. When I run it under gcc 4.7, I'm surprised by what I see. I recently went through Sumant Tambe's presentation materials from his Silicon Valley Code Camp presentation, "C++11 Idioms." He argues that an emerging idiom is to pass arguments to constructors by value, because this takes advantage of move opportunities when they are available. I was surprised to read about this emerging idiom, in part because I had not heard of it (I'm supposed to be clued in about this kind of stuff) and in part because it runs contrary to my own thinking on the subject, which is to use perfect forwarding. He concludes that "it is too much noise!" Regarding the use of templates, well, I have to say that if you view the use of templates as a notable downside in C++ software development, you should probably rethink your choice of programming language. For at least the past decade, templates have been as mainstream as classes. That leaves the issue of restricting template argument types and the use of enable_if. The case that Boris (and hence Sumant) considers is a operator+ for matrix objects, but I want to reconsider the first problem Sumant addresses (how to declare constructor arguments) with perfect forwarding in mind, because, as it turns out, enable_if plays a role here that I think clarifies the situation. No muss, no fuss, no enable_if, no testing for whether the argument passed to n was an rvalue--none of that stuff. Very nice. The fundamental problem is that perfect forwarding and overloading make very bad bedfellows, because perfect forwarding functions want to take everything. They're the greediest functions in C++. If more constructor overloads are added, or if the constraints on when the perfect forwarding constructor is applicable become more complicated, the enable_if-related code can become, er, unpleasant. Such unpleasantness is presumably the noise that Sumant Tambe refers to when he rejects perfect forwarding. In those cases, I think his preferred solution to the problem of declaring constructor parameters--take everything by value--is reasonable. The generated code isn't quite as efficient as you'd get from perfect forwarding, but the overloading rules are a lot easier to understand, and the resulting code is easier to both read and write. I still think that perfect forwarding is the language tool you should prefer when you need to write constructors and similar functions (e.g., setters) that simply shuttle values from one place to another. That's what it's designed for. If you need to overload such functions, however, things get very messy very quickly, and except in the most demanding of performance-sensitive applications and libraries, I think it's reasonable to fall back on pass-by-value as the parameter-passing mechanism. But these are still early days in C++11 programming, and we're all still learning. I welcome your thoughts on how to declare constructor parameters, the proper role of perfect forwarding, and the wisdom of passing parameters by value. A couple of days ago, I blogged that my article on "Universal References" had been published by Overload, and I said a video of me presenting this topic at C++ and Beyond would soon be available. Soon has become now. Servers are standing by, and on-demand viewing is available at Channel 9. Many thanks to Charles Torre and to Microsoft for recording and hosting the presentation. I hope you like it and find it useful. If you do, please tell others about it, because I'm trying to inject the term universal reference into the C++ vocabulary, and I can't do it alone. One of the most difficult aspects of C++11 for me to wrap my head around was the meaning of "T&&" in type declarations. “It means rvalue reference,” I was told, and that was fine until I was also told that in some cases, it actually means lvalue reference. I fought with this seeming contradiction for a couple of years before my head cleared and I decided that we need to distinguish declarations for rvalue references from declarations for things that look like rvalue references, but may not be. I call these latter things universal references. I hope the term catches on, because I think it makes the matter a lot easier to understand. In this article, I describe the two meanings of “&&” in type declarations, explain how to tell them apart, and introduce new terminology that makes it possible to unambiguously communicate which meaning of “&&” is intended. Distinguishing the different meanings is important, because if you think “rvalue reference” whenever you see “&&” in a type declaration, you’ll misread a lot of C++11 code. I hope you find the article both interesting and useful. A lot of uninvited stuff shows up in my electronic mailbox. There's spam, sure, plus my share of links, stories, and pictures from friends and family members who are more easily entertained than I am. I also get questions and comments and links to C++- and software-related things people think---or hope---I might be interested in. I skip a lot of the "entertainment" I get from friends and family (none of whom read this blog, so I'm not worried about offending them), but in the realm of C++, I look at everything I get, because it's part of my job as a C++ consultant. Most of the stuff I see I dismiss without action, because I don't think it's interesting or I don't see how it's useful or I simply don't have time to really analyze and pursue it. There are, after all, only so many hours in a day. For the last decade I've been running a big C++ cross-platform toolkit called JUCE. Won't attempt to describe it in this email - there's plenty of info about it on my website if you want to learn more. I've just been making some announcements about a new tool that I'm aiming to release soon, and being proud of what I've managed to cook-up, I thought it'd be worth pestering some of my C++ guru heros to have a look at it. It's something that nobody's managed to do in C++ before, so I think you'll probably find it interesting! Hope you can spare 10 mins to check it out! I did check it out, and not just because he called me a C++ guru hero. 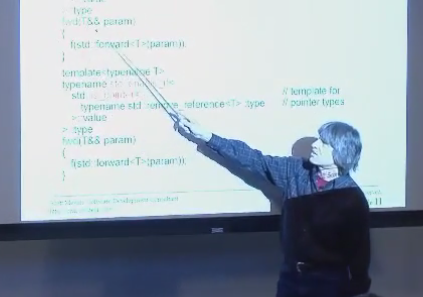 Though I had not watched all of Bret Victor's demo, I had watched part of it, so I had some idea what was involved, and the idea that something similar could be done for C++ intrigued me. Also, when people tell me they have done something in C++ that nobody has done before, that tends to catch my attention. Most important, at the time I was trying to figure out what to do with Julian's email, I had much more pressing things to work on that I didn't want to attack yet, so I needed a way to tell myself I was working without actually, you know, working. So I toddled over to the screencast Julian had put together and invested the six minutes and thirty-six seconds it runs. It's a nifty demo, but the application area is GUI development, and that's not really an area I know a lot about. So when he ran the GUI from the compiled application, changed the application source code, then showed how the GUI updated itself, I was impressed with what must be happening behind the scenes, but I didn't have to hold onto my hat, nor was I concerned that my socks would be knocked off. And when he modified the running GUI and some literals changed in the source code, I thought it was, well, nice. But then I saw something that made me replay that part of the video several times. Not only did the literals in the source code change when he moved a GUI widget around, he was also able to have new statements added to the source code by interactively editing the running GUI. He was editing the program source code through the GUI. Maybe this is old news. Maybe Visual Studio and Eclipse and various other IDEs for GUI development allow you to create and edit source code via both text (traditional source code) and generated GUI (arguably an alternative form of source code). As I said, I'm not a GUI development guy, so I have no idea what the state of the art in this area is. What I do know is that Julian's demo is consistent with the idea that there is no such thing as canonical source code. C++ text is source code, of course, but there's no reason that the GUI generated from that source code can't be viewed as source code, too. Since they're both source code, it makes sense that the underlying program can be edited through either. One could argue that each representation of the program (C++ text and displayed GUI) is simply a view of that program, and the program itself is something more fundamental--something more abstract that transcends the concrete syntax and semantics of whatever view is used to see and manipulate it. I'd like to believe that this is a reasonable argument, because, in essence, this was the topic of my PhD research many years ago. My dissertation, Representing Software Systems in Multiple-View Development Environments, explored how one could represent programs such that they could be viewed and edited through any of a variety of concrete syntaxes ("programming languages"). Let me save you the trouble of reading my dissertation by summarizing my conclusion: It's hard. I'm guessing that Julian was not expecting that his demo would remind me of the research I was pursuing over 20 years ago, but it did. And that's why I'm blogging about it. Besides, as far as I know, he has done something in C++ that nobody has done before, and groundbreakers like that deserve encouragement. If you're wise in the ways of GUI development with C++, I encourage you to watch Julian's screencast and offer him feedback to help him continue his work. I'm sure he'd be pleased to hear from you. I'm sure that high-performance server software is standing by to count your clicks and whisk you to the land of irresistible C++ discounts. 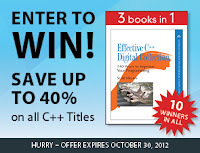 To get the full discount, be sure to use the discount code "CPLUSPLUS". Many of Addison-Wesley's recent C++ titles are introductory, and it's been so long since I was in need of that kind of book, I don't offer recommendations on them, though certainly many of the horses in the Addison-Wesley stable have excellent reputations. One book I have looked at and strongly recommend is Nicolai M. Josuttis' updated-for-C++11 second edition of The C++ Standard Library. Getting 30% or 40% off that book (or book+PDF combo) would certainly be nice. And frankly, if you don't yet own a copy of C++ Templates: The Complete Guide (by Nicolai M. Josuttis (who at this point should be sending me kickbacks--but, alas, isn't) and David Vandevoorde), this would be a good time to fill that hole in your library. Happy shopping, and good luck with the drawing to win the combined bits of my books. I hope it goes without saying that you don't need to buy anything to get a chance to win the digital versions of my books, but in case it doesn't, you don't need to buy anything to get a chance to win the digital versions of my books. So sign up! PS - My mole inside AW whispers, "We are advertising this promotion as applying only to C++ titles, but it works for any set of titles from InformIT." So if you want to scratch that Scala itch that's been bugging you or you want to combine your buying power with that of colleagues who use--gasp!--other languages, now's your chance.